Here are flower garden design tips to help you plan a new garden bed. And if you’re looking for ways to make existing plantings look even better, you might find inspiration in the pictures below. If there’s one big mistake gardeners make first time out, it’s skimping on the width of their beds. Make your flower beds wide enough to add flowering shrubs such as hydrangeas or rhododentrons, and even small flowering trees. Try not to maroon woody plants in a sea of lawn – they look better incorporated into your planting beds. 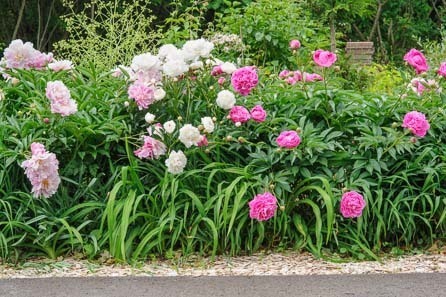 Wider beds – at least five to six feet wide – are more attractive and give you more planting opportunities for that lush, layered look you’re after. Every garden bed needs sense of definition – a line that sets it apart from the rest of the garden. Straight lines work well, but most people seem to prefer curved lines. If you go for curves, avoid wiggly lines. A smooth sweeping curve or a clean straight line always makes a more elegant flower garden design statement than a wavy pattern snaking around the garden. In flower gardening, more is definitely more. That mass of bloom you see in a well-planned garden comes from clumps made up of drifts of three, five, seven, or more of the same plant. A garden full of one of this and one of that tends to look jumbled. Most experts recommend planting all except some of the largest stand-alone plants in odd-numbered groupings or three or more. Most plant tags give this information. Think of your plants in terms of edgers (front of bed), fillers (middle of bed) and backdrop. 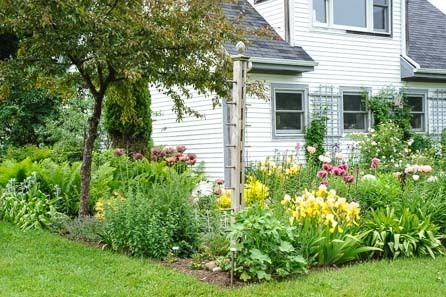 Plant taller annuals and perennials toward the back of your beds, but break this flower garden design rule occasionally, but letting a taller group rove into the middle, or by placing some tall plants that are airy and see-through near the front. 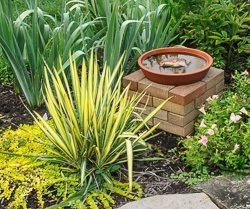 This works nicely with ornamental grasses or Brazilian verbena. Place plants about as far apart as each plant’s ultimate spread. For example, a perennial that grows 24 inches wide should be about 20 to 24 inches from its neighbors. There are many ways to do this effectively. Try limiting colors to those that harmonize well, or put some plants into groups of three to five or more and repeat them among single specimens of other plants. You can also pull things together with a strong backdrop, such as an evergreen hedge, or by using one type of plant as the edger along the front of the bed. 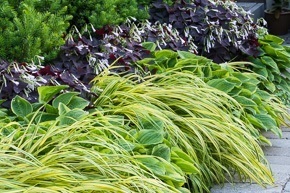 Repeating certain plants, colors and textures adds continuity to beds. For example, if you have flower borders that face each other, repeat at least one grouping of plants on each side. 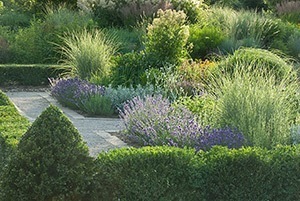 Staggering the groups – not planting them right across from each other – makes the planting more dynamic. Symmetry is a formal approach to garden layout – for example, planting the same upright shrub on both sides of a gate. But you can also do this asymmetrically, for example, three mounded boxwoods on the one side of a path can balance the visual weight of a tall, upright evergreen on the other side. The most appealing flower garden designs include accents that immediately catches your eye. A bench, an arbor, a gate, art or statuary can all be good focal points. 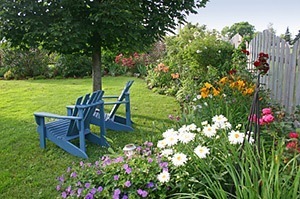 Larger gardens can accommodate more than one focal point. 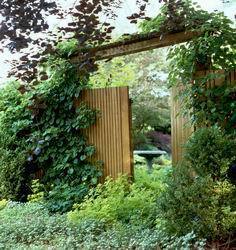 In a small garden, do something special to mark the entrance – a gate through an arbor is a time-honored classic.